10 mm lens is a default setting. Users are not allowed to replace the lens and filter. Please request training through IRIS system. 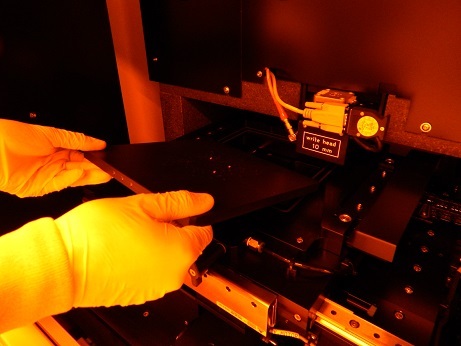 User can purchase a blank photomask from us. Please contact Charles Veith. Etch: 60 sec, agitating, "Chrome Etchant"
1. Log-in on the IRIS scheduler. 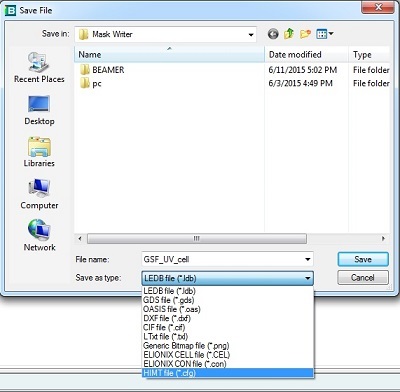 It is possible to convert CAD file to Heidelberg Format file using BEAMER. 1. 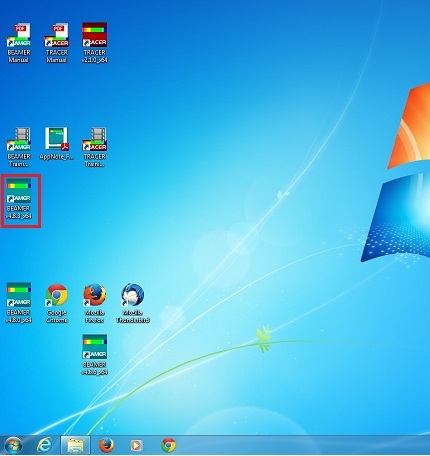 Click the icon on the desk top screen of the workstation in Bay 1 to open BEAMER (ver.4.8.3). Note: Please request for advanced training in IRIS system for BEAMER, if you want. 2. The starting window opens. 3. 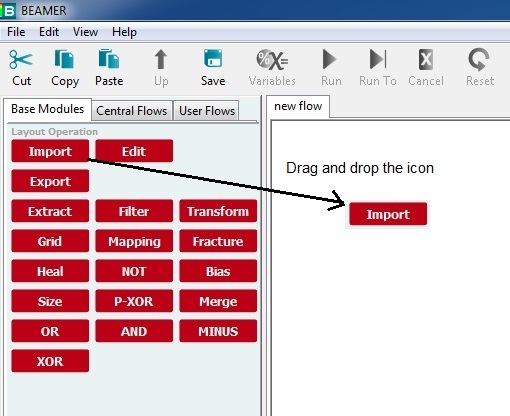 Drag and drop the "Import" commnad icon from the left onto the blank "new flow" field on the right to create a work flow diagram, using the mouse. 4. 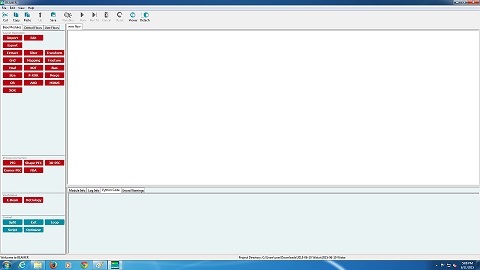 The Open File dialog box appears. 5. 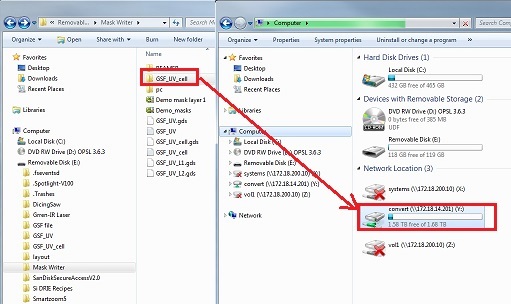 Open your file from the list of your USB memory. Preferably, import a GDSII pattern. 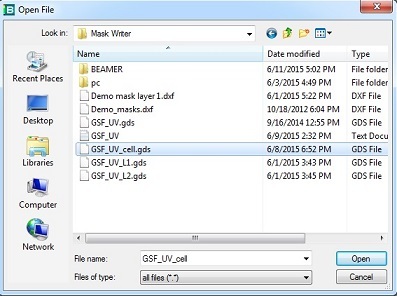 The GDSII format is much more robust than DXF. 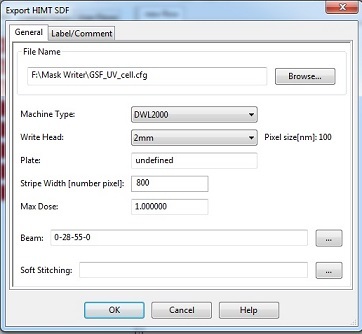 If you really really need to use DXF, then be sure to save it as DXF R12. Alternatively, monochrome bitmaps and greyscale PNG files can be imported as well. 6. The following dialog box appears. 8. 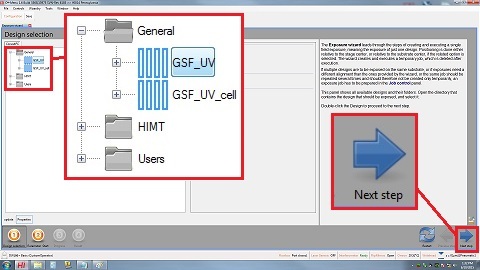 Create the following work flow diagram by dragging and dropping the command icons, as shown above. The last "Out HIMT" icon is the "Export" command icon. If one icon is contacted with another icon in the "new flow" field, the both icons will be connected. You can also use the mouse to connect the two command icons. 9. 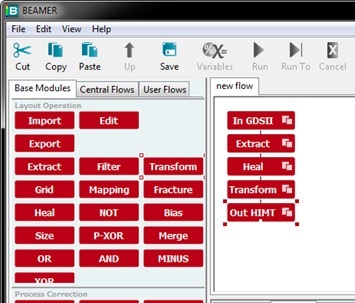 When all the modules have been set, click the "Out HIMT" icon and run the flow. This step is optional. If you have several layers in your pattern and need to extract layers for exposure, you can do that here. Again, this step is not required if your pattern contains exactly the pattern you want to expose. 1. When the "Extract" command icon is dropped, the following dialog box appears. 2. 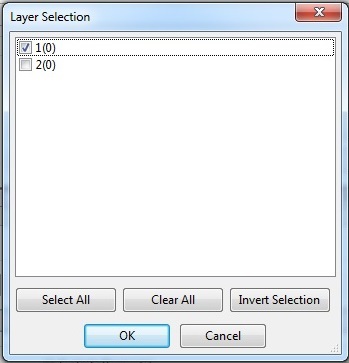 Click the button for Layer(s). 3. 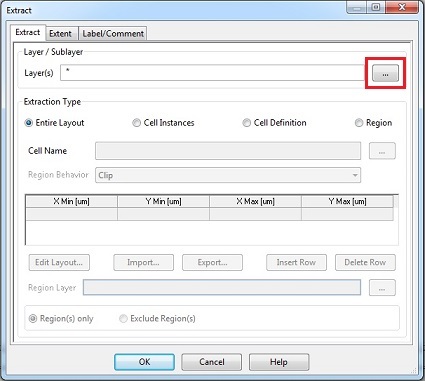 Select the layer desired. This step is also optional. Overlaps should be removed if they exist in your design. Add a Heal modules to remove overlaps. 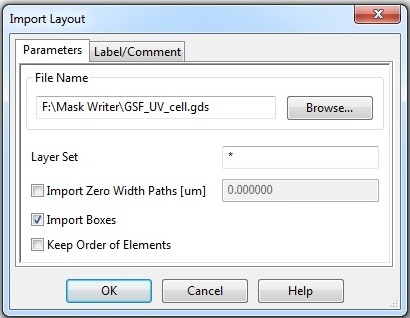 If you are using the laser writer to write a mask, use the Transform module to flip the pattern about the Y-axis so that the image won’t appear backwards on your mask plate after development and when you use the mask aligner to transfer your pattern to the wafer. 1. When the "Export " command icon is dropped, the "Save File" dialog box appears. 2. Choose the "HIMT" file as type of the file. 4. The following dialog box appears. 1. 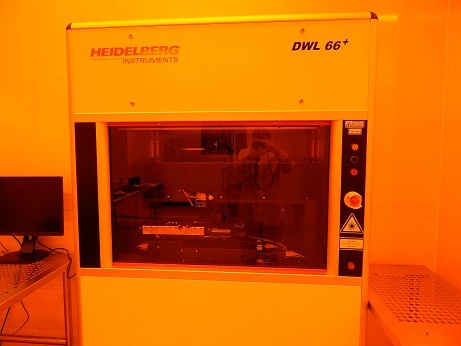 Drop the folder at the root directory of the Y: drive in the Heidelberg system. 2. The converted file folder contains the job folder and files. 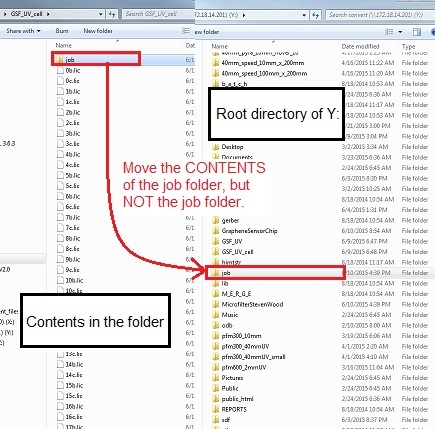 Move the CONTENTS of the job folder in your pattern directory to the job directory in the Y: root directory. WARNING! : DO NOT move the job folder itself. 1. 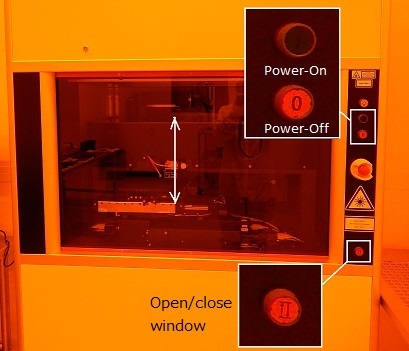 Open the flow box window by pressing the lower right button. 2. Turn off the chuck vacuum. 3. 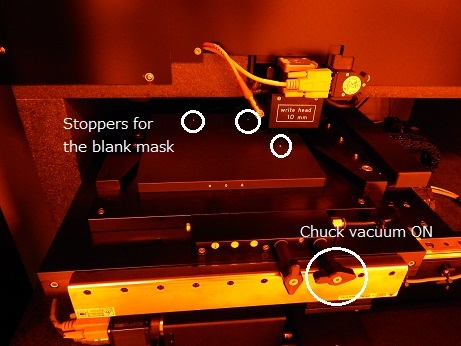 Remove the sample chuck. 4. 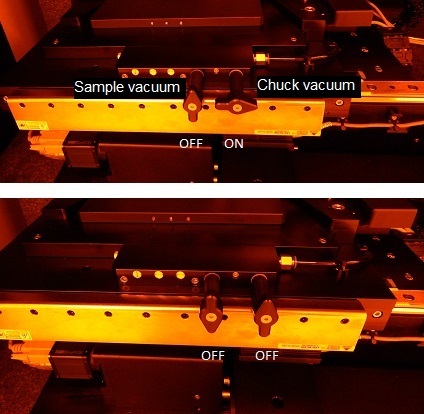 Install the sample chuck desired. Note: Be careful about the direction of the chuck. 5. Turn on the chuck vacuum. 1. Load the blank mask. Note: Make sure that the blank mask is placed at the three stoppers. 2. Turn on the sample vacuum. 3. 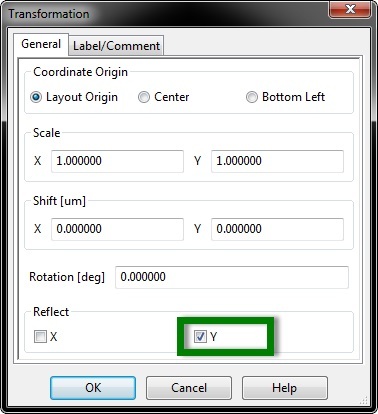 Close the flow box window by pressing the lower right button. 1. 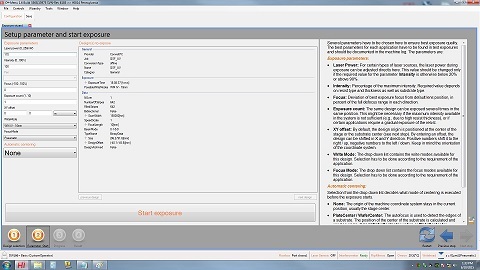 Click the icon to open the exposure program. 2. 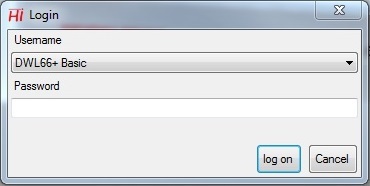 The log-in dialog box appears. 3. Choose "DWL66+ Basic" from the drop-down menu. 5. 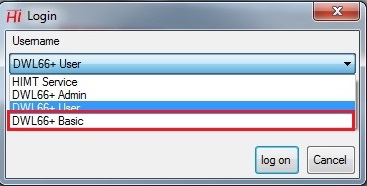 Click the "log on" button. 6. The follwoing window appears. 1. Click your file to highlight it. 2. Click the "Next step" button. 4. 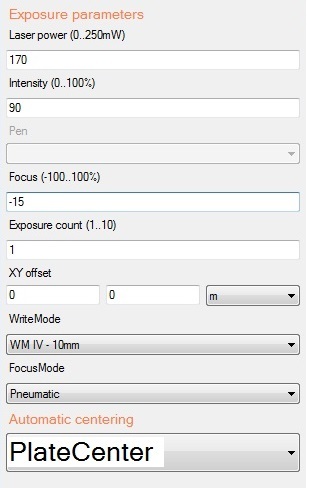 Set up the exposure parameters, according to the "Exposure Parameters" file posted on the right side of the desk top screen (see below). 1. 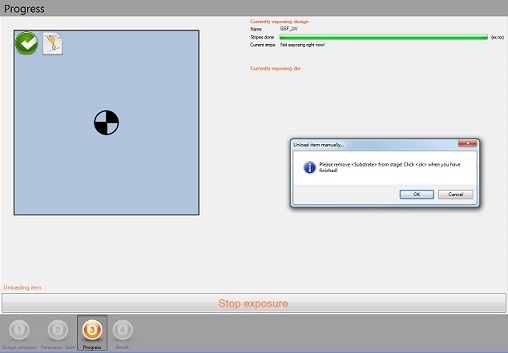 Click the "Start exposure" button. 2. The following dialog box appears. 5. 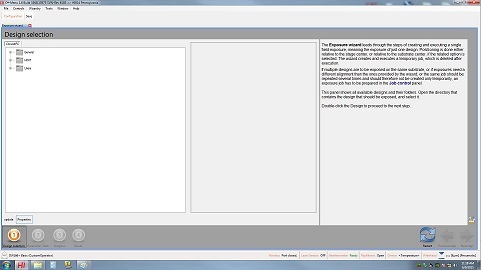 The following window appears when the exposure is completed. 6. Click the "OK" button in the dialog box. 1. Open the flow box window. 2. 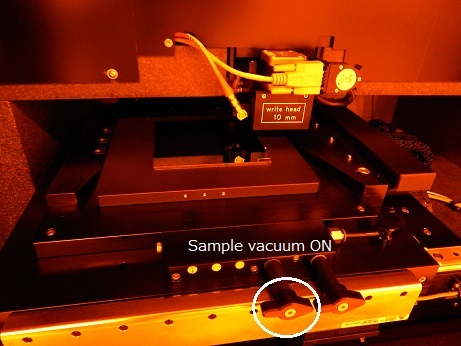 Tuen off the sample vacuum. 3. 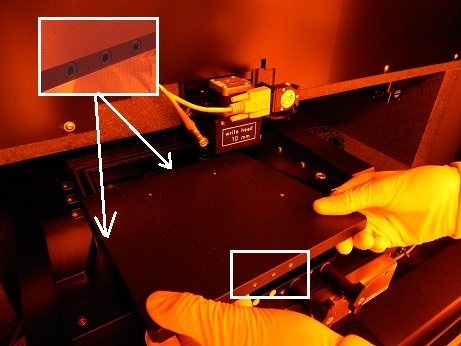 Remove the substrate exposed from the tool. 5. Close the exposure software program. 1. Log-out on the IRIS scheduler. No trouble has been reported so far. 5/1/2017, by Hiro, added troubleshooting.